Cone cakes kids cooking party. 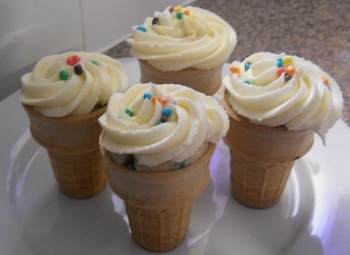 For a cone cakes kids cooking party kids get a chance to prepare the cake batter, pour into cones and decorate the finished product. Prepare cake mix according to directions. Allow everyone to have a turn stirring and adding ingredients. Give each child a cone and have them spoon batter inside about ½ full. Place cone inside muffin tins and have an adult bake for 15-20 minutes. While waiting for cone cakes to cook, prepare another recipe you have planned, decorate aprons, chef hats or play games. 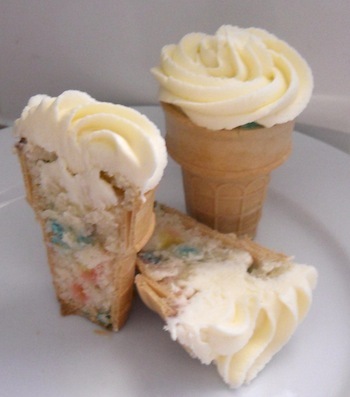 Allow cone cakes to cool. Kids can decorate with frosting, sprinkles, crushed cookies, chopped nuts, etc. Back to Kids parties from Cone Cakes kids cooking party.